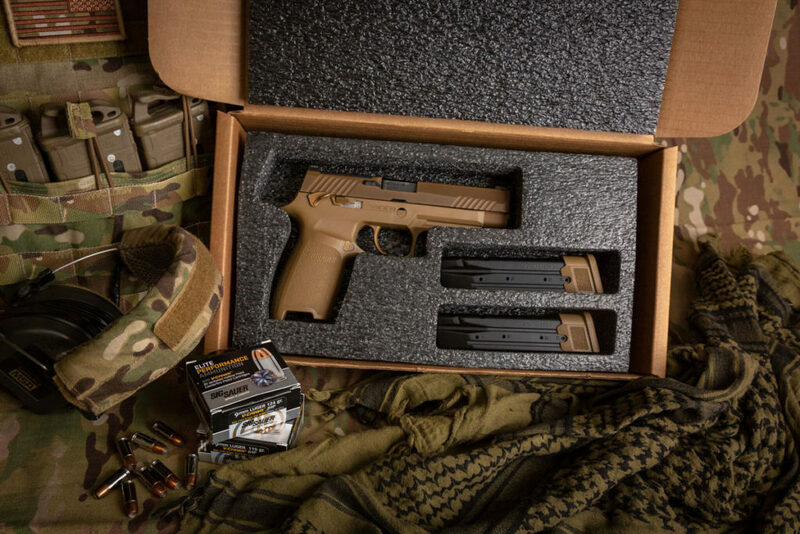 The SIG M-17 pistol is serving in combat with the US Army. The story has a happy ending, but it took years and millions of rounds to get there. The competition for the Army’s Modular Handgun System (MHS) contract was one of the most rigorous and highly competitive review processes in the history of military firearms. It was scrutinized and contested and endlessly questioned. 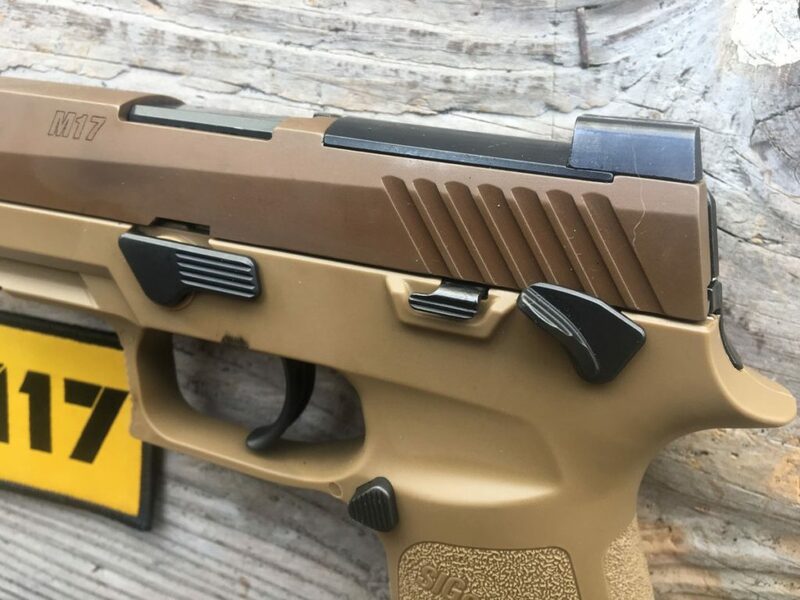 SIG submitted a 9mm P320-based platform. The only true modular candidate, SIG’s XM-17 performed well during the selection under all conditions the Army could dream up. After over two million rounds of testing, the XM-17 became the M-17 and a new icon was born. The service handguns chosen by the Army have always become essential weapons; the Remington New Army, the Colt Single Action Army, Browning’s M-1911 and the M-9 Beretta are all classics. Now you can get the latest chapter in this historic line. Other manufacturers have been selling their versions of the MHS while SIG has been busy making guns for the Army. Every branch of the military has adopted the M-17 and the smaller version, the M-18. At last, Sig has sent the military enough guns that they can make some M-17s for the rest of us. There are two civilian versions, The M17 Commemorative and the P320-M17 and they are on their way to an FFL near you. The P320-M17 closely follows the specifications of the U.S. Army’s M17. The 9mm P320-M17 features a coyote-tan carry-length grip module available in three sizes and comes standard with a manual safety. Non-manual safety P320-M17 pistols will be shipped at a later date. 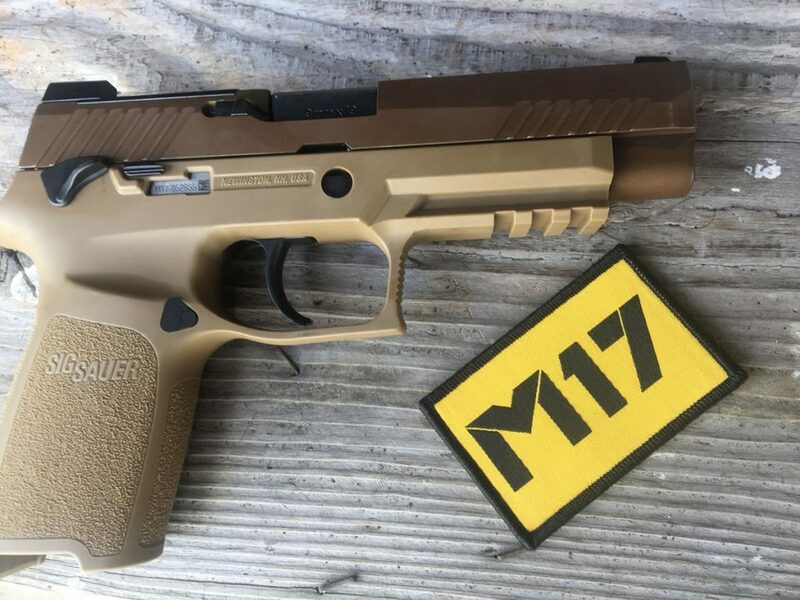 There is a coyote-tan PVD coated stainless steel slide and black controls just like the pistols currently being shipped to the U.S. Army. The sights are a SIGLITE front night sight and removable Night Sight rear plate. Many internet experts, who have never touched an M-17, believe that the small arms professionals in the Army, the Navy, the Marines, the Air Force, and the Coast Guard have gone through millions of rounds of extensive testing and picked the wrong gun. After my own limited test firing, just over three thousand rounds through the M-17 and the 320-M17, the M-17 is my choice too and I believe that the army chose the best gun for the job. The P320-M17 easily clangs the CTS steel targets at 50 yards. At the Academy we shot steel out to 75 yards. I got a 320-M17 a month ago. I have taken it to classes as a student and an instructor. I have shot thousands of rounds of ball and hollow points with no issues and no cleaning. I have lubricated it and I will probably clean it when it gets dirty. This is not a torture test; the gun just isn’t dirty enough to require cleaning yet. 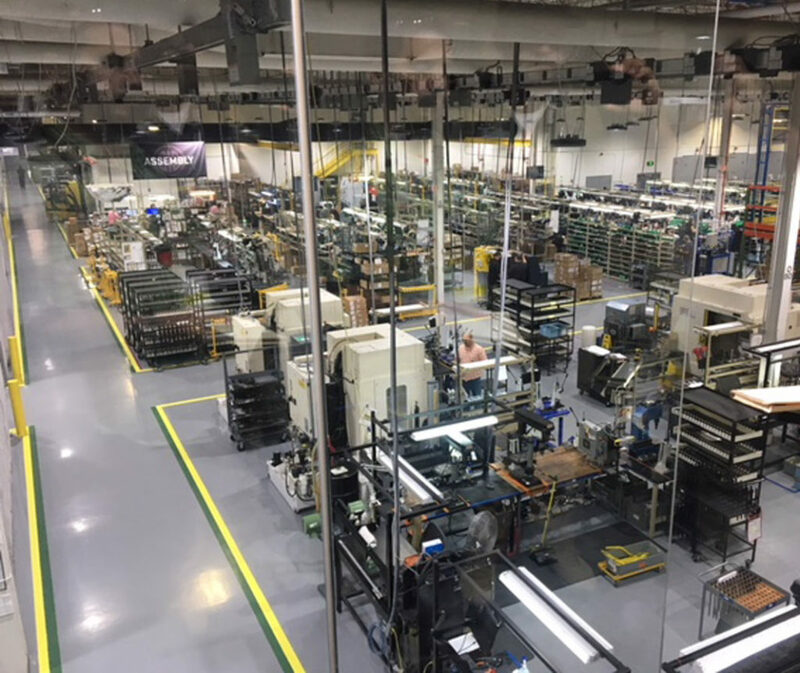 I had the opportunity to travel to New Hampshire to visit the SIG SAUER factory. The technology is highly automated with multiple quality checks. I got to walk the production floor and see every step of the process from machining to assembly. Trained professionals assemble guns and reject any component which isn’t perfect, but that is only half the story. 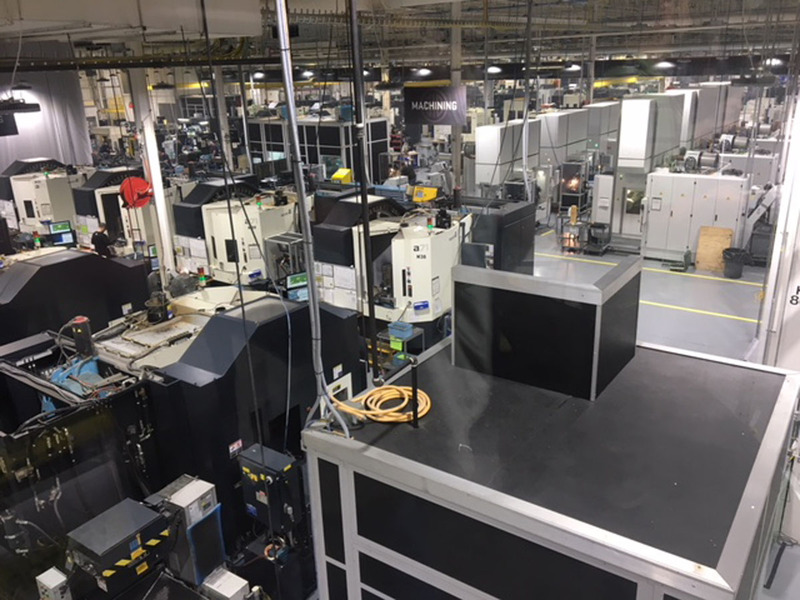 There is a quality plan for each part which dictates how many parts from each lot are checked at special robot laser verification stations which check every angle of a part. These check stations are connected to each of the automated CMC machines and automatically update the instructions to the machines, in real time. Problems are anticipated and avoided. This reduces bad parts, keeps them out of the supply chain and cuts costs so SIG can make better and less expensive guns. They test fire every gun and I got to witness the process while I was there. I also got to go to the SIG Academy and shoot the 320-M17 for a day under strict the tutelage of a couple of former Special Forces operators (one who is still active) on their staff. I shot 400+ rounds of SIG FMJ ammunition at paper and steel targets. We ran the guns hard and shot them hot. We worked up to multiple target drills and shooting a scenario in and around cars and barricades. The guns got hot and dirty and they all ran. 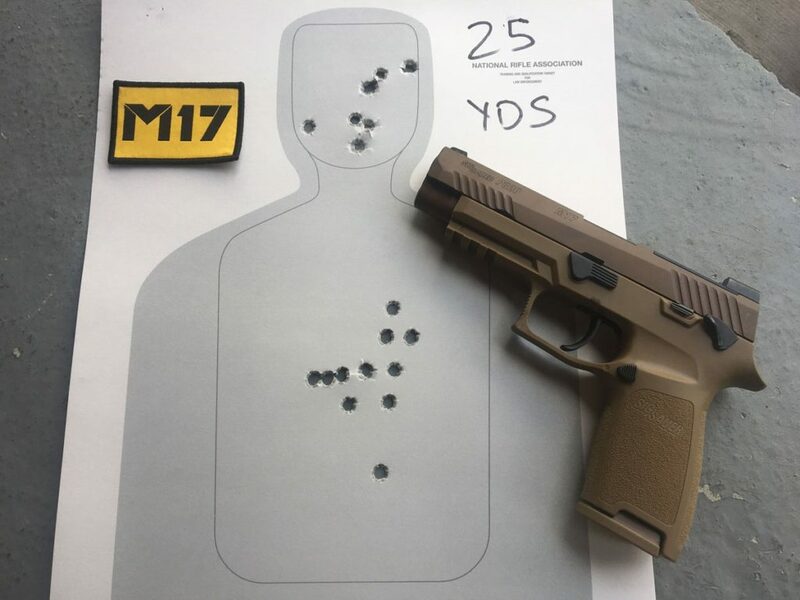 The P320-M17 groups well at 15 and 25 yards. 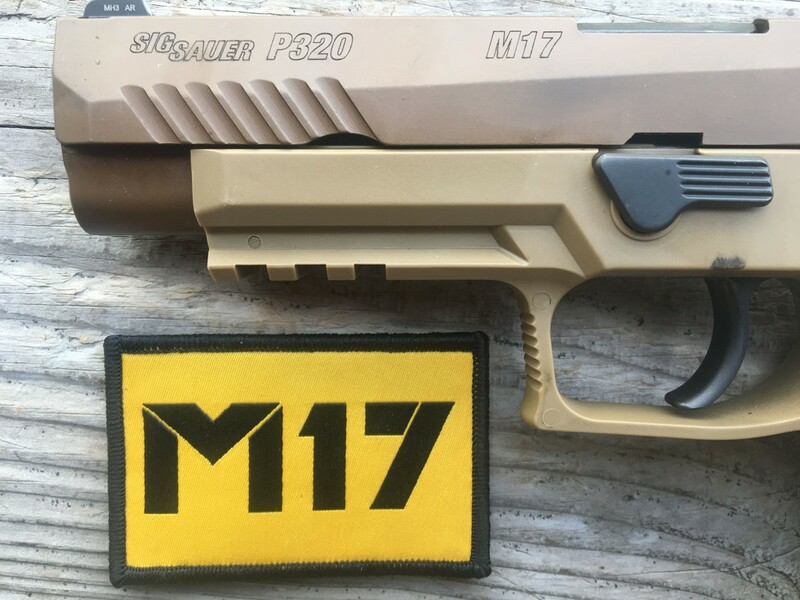 The M17 Commemorative pistol shares the same components, coatings, and markings as the original pistol that was awarded the U.S. Army contract for the modular handgun system (MHS). 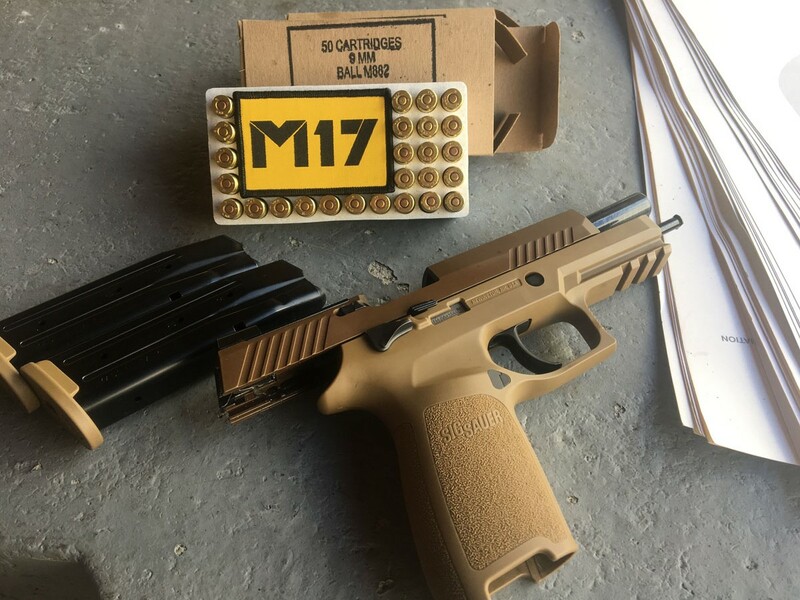 Just like the military M-17, the Commemorative comes with a coyote-tan carry-length grip module and a coyote-tan PVD coated stainless steel slide. The Commemorative has coyote-tan colored controls just like the original pistols shipped to the 101st Airborne. The Commemorative is an exact replica of the first M17s the military got. SIG has made 5,000 available to the public. It even ships in the same cardboard box that the military gets it in. As a side note, SIG is no longer offering the coyote-tan colored controls, even for the military. 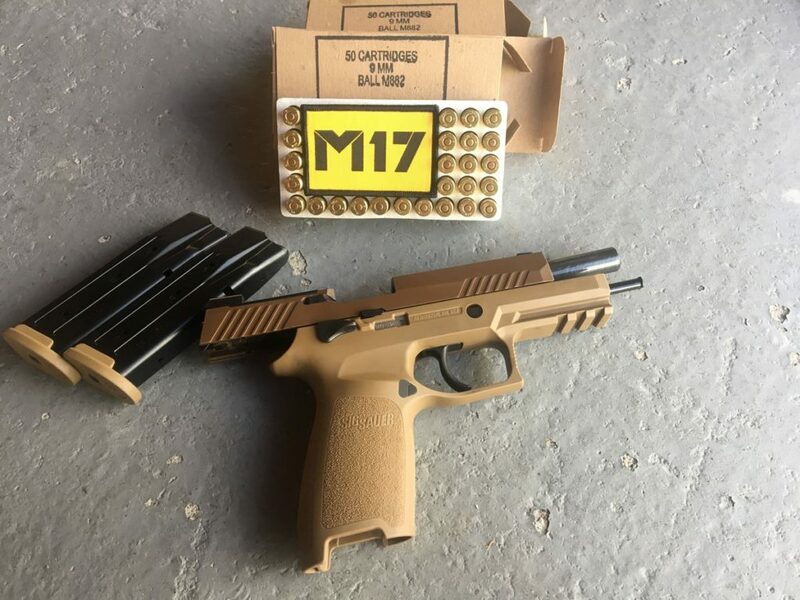 So the civilian version of the M17 looks just like what the military is currently getting. The pistol features a SIGLITE front night sight and removable Night Sight rear plate with the same optic cut as specified by the MHS contract. It comes with two 21-round magazines, one 17-round magazine and a manual safety. Only 5,000 M17-Commemorative Edition pistols have been produced. Each one carries a unique identifier (UID) just like the Army guns. 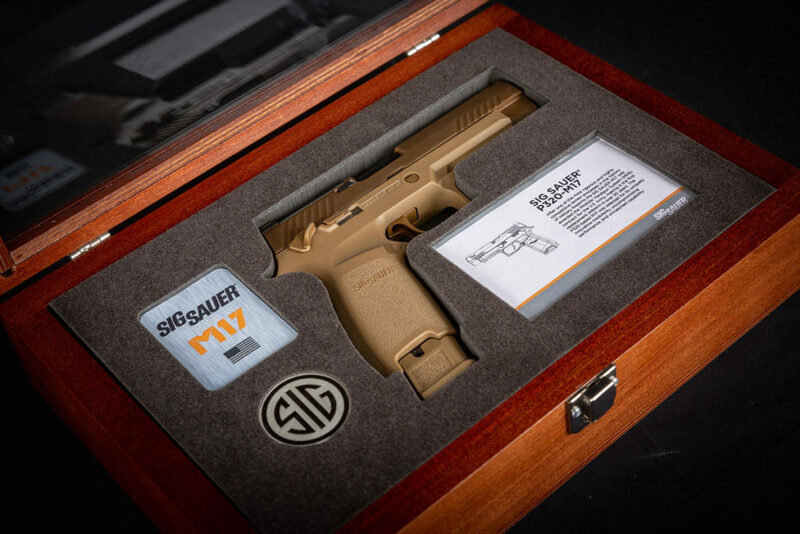 From the pistol to the same cardboard packaging as delivered to the U.S. Army, the M17-Commemorative Edition is identical to the U.S. Army’s official M-17 service pistol. Register your M17-Commemorative and you get an official certificate of authenticity and a commemorative challenge coin, both with serial numbers matching your M17-Commemorative pistol. To complement these guns, an M17 Collector’s Case is available separately at sigsauer.com/store. The case is a solid cherry box, with dark mahogany stain, a tempered glass top, a brushed nickel latch and a keyhole back for optional wall-hanging. The M17 Collector’s Case features a slate-grey flocked foam insert with an affixed U.S. Army logo, and precision laser placement cuts for the pistol, certificate and Official Challenge Coin. 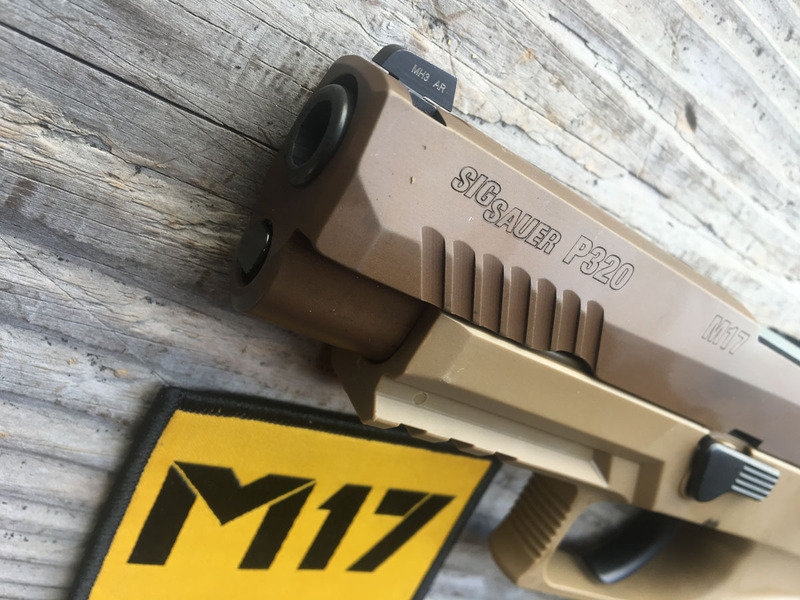 For more information on the SIG M17 visit SIG by clicking Here. Ep. 30 Should I Shoot? Have You Chosen Not to Be a Victim? Next post: What the Hell is 8.6 Creedmoor? Don’t know a thing about this gun but was attracted by the ‘Tomb of The Unknown Soldier’ presentation pieces. I like Sigs, in general – even recommended the 220 when we were looking for an issue, a few years ago (went with the H&K p2000 9) – but I do know a friendly review when I read one. Everyone has favorite(s) and this one may be the creme de la creme … but a review could be less obvious. Hard on the trust factor. Only problem I had was trigger slap almost as bad as the pre regulation Romanian wasr rifles.I’ve seen after market triggers that’ll fix that. In the dozens of M-17s, M-18s and SIG 320s I have shot, I have never felt anything like that. With a striker fired gun, I don’t see how it is possible. I purchased a Sig P320 carry model, 9mm. It is very accurate& it will SHOOT with a GLOCK!! I am waiting for a gun shop to get one of the X- change kits in .40S&W. I like to plink with 9mm, but I carry a 40S&W or 10mm: GLOCK!! That is my OPINION, & I MIGHT be wrong!! I went through this article TWICE..Nowhere can I find the caliber of this animal…Two pics show boxes of 9mm but nowhere does it say it shoots them. You are welcome to come to the range and we can try to melt mine. Bring ammo. I noticed through out the sales pitch article there was no mention of all the bugs that needed to be worked out and if they have, once military personnel started to actually use and train with them, even had cycle problems with ball ammo! The bugs are long gone. I haven’t seen any performance problems. You should spend more time at the range and less on the internet. I hope they produce an M17 with a threaded barrel. Both the Military and Police are putting way too much emphasis on over priced plastic handguns and not enough on good light weight carbines and a real combat rifle like the Springfield M-1A. I was 11Bravo from 1975 to 1981 and am currently serving in Law-Enforcement, about to retire. In most situations I’d rather have a Ruger 10/22 Carbine than a 9mm handgun of any make. I love shooting the AR-15/M-16, but if I was over in the sandbox, I’d want a Springfield M-1A, no need for select fire, that’s what “60” Gunners are for!The FBI and Military have wasted a billion dollars playing around with plastic 9mm handguns. Give me Steel and Walnut 1911″s and M1’s-M-1A’s any day, all day! I entered active duty in 1978, just in time to “live” the transition from the Colt 1911, .45 to the Beretta 92, 9mm; and after 28 years of active service I retired in 2003 and have since acquired over 240 seperate firearms (167 of them being pistols). I loved my Colt and the stopping power of the .45 but was initially impressed with the increased capacity of the Beretta….BUT, after watching 9mm rounds bounce off of standard vehicle windshields in Iraq, Kuwait & Bosnia; I chose to carry my own personal Sig P220 whenever I could sneak it past our quartermaster. Since retiring, I’ve chosen the Glock 21 and 30 as my primary & back-up carry weapons and, my newest addition, the Glock 41, Gen 4, MOS as my “target” toy. I like my Sigs, I enjoy my Colt .45’s, Beretta 92 9mm’s (although I think the Taurus PT-92 is a better made weapon) but I LOVE MY GLOCKS. Polymer, steel, plastic, aluminum, etc., etc., etc. ; i just do not believe there is a better made, more reliable, economical or user-friendly pistol on the planet. That’s just my opinion and I’m always open to debate. I like it! Too bad we civys cant get some “ball” steel core/steel tip 9mm NATO rounds! Now THAT would be an effective 9mm against any short/medium range enemy target! NATO rules dictate the use of FMJ ammo not as a performance enhancer, but instead the opposite. We use FMJ steel core because it’s more effective to wound rather than kill an enemy because it takes more bodies out of the fight if they have to drag their buddy off the battlefield. That and steel is a lot cheaper than lead. Some special ops teams use hollow point ammo depending on the mission, but we’ve always been handed FMJ garbage. It’ll poke a hole in whoever it hits but it’ll be a 9mm hole all the way through. Compare that to a GSW from a decent hollow point and you’ll see why most defense ammo is not FMJ or steel core. If you want both large wound channel and penetration look into Lehigh bullets. Great stuff. Much more effective than FMJ. Military service ammo for the M-17 is JHP. P320 “The only true modular candidate”. That’s a real stretch. We have no real idea how many different size grip frames and slides were offered in the APX. The APX has the modular chassis just like the Sig. 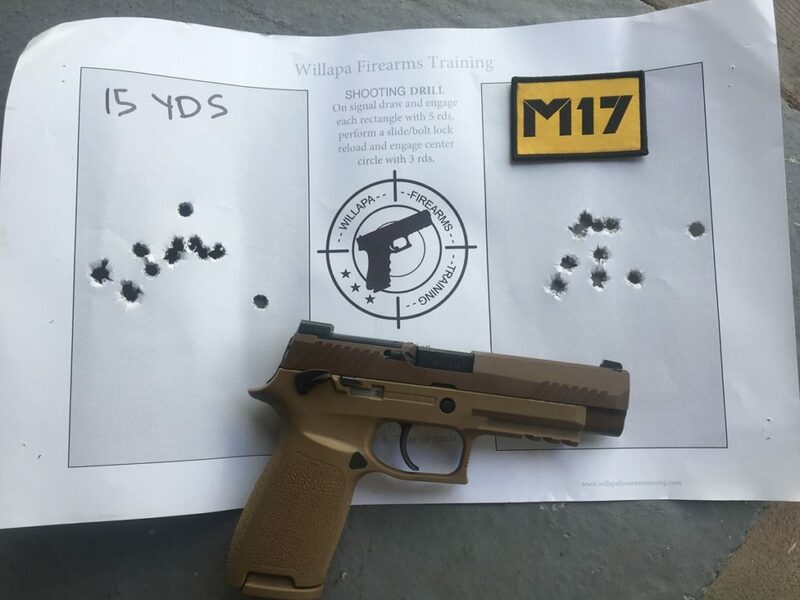 I just bought an M17 and took it to the range. It is average at best as a striker fired gun. – Trigger is average for a striker gun. I’ve got a Gen3 G19 that’s almost 20 years old that is better. VP9, APX, P10C all have the M17 beat. – Chamber is so large the brass gets a huge scorch mark and the gun is really dirty inside after only 200rds. Looks like my VP9 after 1000rds. The author said his was still clean after long days of use. Sounds like some chamber reamer variability. – Slide release is small and really close to the safety lever. Have to get use to swiping both at the same time or use the 1911 method of support hand thumb to drop the slide. Just My Opinion, so fire away. I’m sure the Sig is a decent enough gun; most guns that make it through Army testing eventually turn out to be pretty good guns. It is unfortunate that the only reason the Sig beat the Glock is because Sig underbid the contract by several millions of dollars, which will probably come back to haunt the Army when Sig starts adding costs in to the original contract. And yes, they can get away with that. Beretta beat Sig on price for the M-9 contract in the 1980s. SIG remembers. The Glock has proven plastic guns work to me; it is just a while and we’ll see what the troops think. I have a lot of friends who swear by their old metal SIG designs; I’m confident it will turn out fine – I may even want a civilian version eventually! These guns are all made in New Hampshire USA. Do you not realize that Sig Sauer is now based in New Hampshire, with manufacturing facilities in several states? The gun was entirely designed, tested, and put into production in the US. They are all manufactured in the US by Americans. Regardless of your preference, this is one case where the troops really are getting good gear, and American workers have good jobs making them. Sig have to find some clown to unload all those garbage poly guns that nobody would buy off on, looks like their found their idiot: The American tax payer. Do we have data on this? As far as I know, other than a few strays, 1911 clones and the CZ-75 are about the only steel guns still in production. Sig, S&W, Ruger and FN don’t offer any. The reason seems obvious to me: polymer frames are cheaper to manufacture, and the runaway success of Glock proved they were viable. However, we can’t really say that means they are more popular with consumers when they’re the only thing on offer. Careful, your silly bias is showing, and it’s not pretty. I thought the military was ditching the 9mm and going BACK to the real heart stopper, the venerable and PROVEN, .45ACP! I guess the PROVEN Old School Guys & Gals got over ridden by the “we know better than you old guys” crowd of MORONS! Another failure in the waiting (Why again were they replacing the M9) and I don’t care what the fanboy author thinks! Not sure what your background is, but I am willing to bet you have never touched an M17. 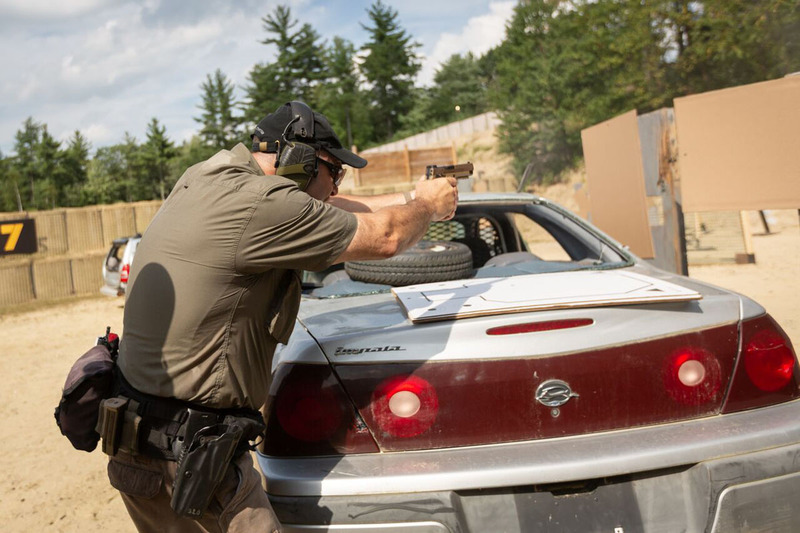 The Modular Handgun competition had soldiers firing over two million rounds through the XM17. The Army, Air Force, Marines, Navy and the Coast Guard all bought the M17 or the M18. Homeland Security ran an independent tests and bought the SIG 320 too. I guess I am not the only fanboy. Don’t care much for the poly guns. Hope the military tested it in jungle and winter environment. Also, certain chemicals are not a friend of poly or other composites. Got brake fluid on an M60 machine gun cover in Vietnam and it melted off. According to Mr Bartucci of Small Arms Solutions, someone considered one of today’s foremost authorities on modern military weaponry and a very smart gun guy overall, these exhaustive tests were conducted in a way that was unlike any other procurement test before them. According to him many aspects of the standard test, which usually is a very thorough, were either skipped or the required number of rounds specified for many of the different portions of these tests were reduced. No, it sounds like the fix was in, Glock got screwed around on their submission, Sig seems to have known a few of the “top brass” ( who are nothing but politicians in uniform, my uniform) and was given that little bit of special treatment they needed to win. Mr Bartucci did a very good analysis of the tests, using official documentation and records and he was shocked at how this particular test was run. That is a very concerning allegation of felony violations of procurement law. Please contact me, any investigative journalist and/or your congressman and share your inside information so we can expose this criminal activity and prosecute the guilty. 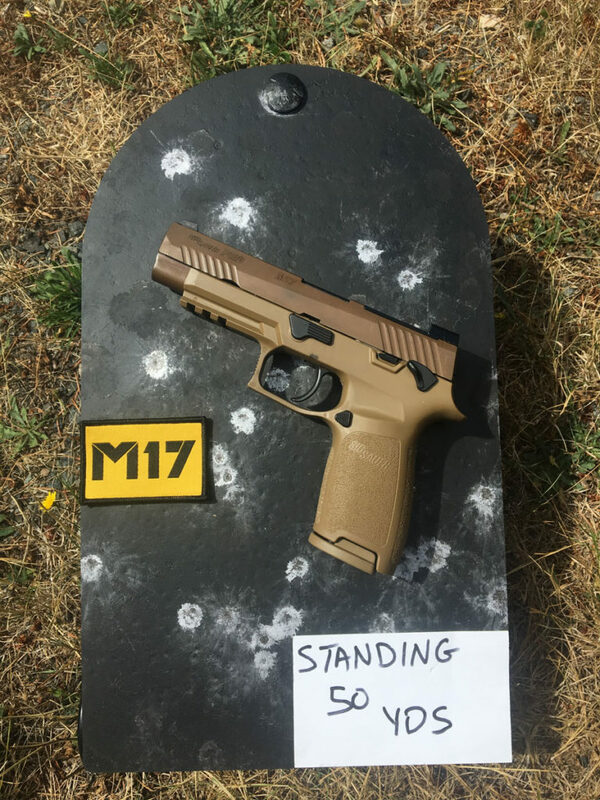 When Mr. Bartucci of Small Arms Solutions gets his hands on an M17 and shoots it, it might change his opinion. Just asking folks to shoot a gun before talking about it. Saves so much time. I think Mark is in on the conspiracy. It still has one major problem. It isn’t an American-made JMB 1911. If you have to use a handgun, it may as well be one that has proven itself in real-world combat for more than a century. But if you ladies like Tupperware parties, don’t bother inviting me. I’ll stick with my real-steel .45 acp. The original single-tap. A BERETTA!?!? Did hell freeze over????? Beretta’s are paperweights, ask any of those who were forced to put up with them in the sands of the Middle east. Perhaps you weren’t there when certain Beretta’s came apart. I would love to have one of these had they been a standard pistol prior to my retirement. I hope for those currently serving, that they will still have access to them when nostalgia strikes. The price seems right and it is an undeniably fine pistol, partisan points of view aside. I for my part have a righteous, off the rack 1911A1 and a Beretta issued exact M-9 and truly cherish them for my Army connection. One thing on this pistol I REALLY appreciate is the serial number being on the drop-in. If a fella queers his frame somehow he can just change out what I assume will be a quite inexpensive piece of poly. Does any one know if a 9×23 conversion is viable in one of these pistols? I found the pedantic hard sell a bit over the top, even immature at best, aa great sidearm sells itself, a heavy handed approach benefits nobody. SIG SAUER has had problems with designs that involve a grip panel as part of the fire control mechanism, if a panel fails or an improper panel is used, problems may result, such a problem seems odd to me. I prefer a design that is ultimately reliable. I love the “I’ll hold on to my Berettas” comment. I have three–will happily sell them to you. They don’t hold a candle to the 320. But then I’m sure there were guys who said “I’ll hold onto my Colt SAA.” It’s just the way things go. The 320 is a great sidearm. Period. I know no one who is active duty who thinks otherwise. There are still some Glock 19 guys but in time, they’ll come around. Wait and see. I purchased a Sig 320RX this spring, my first striker fired pistol, and have put a few thousand rounds through it. No malfunctions of any nature, accurate, easiest pistol I’ve ever owned to clean and have engaged steel targets at 100 yards with success. I’m first and foremost a 1911 shooter but I’ve got to admit the 320 is a helluva pistol. I can’t see any reason why I would replace my M&P with a P320. The M&P is an excellent choice, too. I love my 5” pro series. Having handled the sig, glock, m&p, rugers, springfields, etc. and trained people with them, we just have a lot of great choices in sidearms at reasonable prices. I am currently deciding between a 4” M&P Compact 2.0 and a P320 Carry. May have to get both. The military got this right in that our troops are getting a great new sidearm that should serve them well. Now we need to let them carry some of the quality self defense ammo out there, instead of having to fight barbarians within outdated rules our enemies don’t even recognize. Newsflash! Sig Sauer is a USA based company. They have no ties to Germany anymore. FYI. Correction. Sig has a plant that manufactures in the US. THE COMPANY IS NOT BASED HERE. THEY ONLY CAME FOR THE MONEY. 9mm is useless in cqb at distances why bother. You know that’s not true. If you truly feel that way, let me engage you with sim rounds and I bet you change your mind when you’re reloading after 8 or 9 shots and I still have 11 or 12 left in same magazine. If you’re referring to the power of modern 9mm, we both know you wouldn’t fare well getting hit with one even 90yds away! Im glad the M17 is working out for our heroes! I only wish Sig could get they’re P365 sorted out better. I love the look size and feel of the 365 but its a horror story for many people who bought one or reviewed one. The P365 has been “sorted out” for over three months! Time to move on. Have not had any problems with mine +1,000 rounds so far. I too was glad to here Sig won the contract. I’m in the Air Force and still use the M9. Not a bad gun, but the p320 is without a doubt a better firearm. Just don’t drop it 😮. Im kidding, I’ve seen the negative press and heard the Glock crowd say “I told you so” but the reality is the Sig is a great gun and they addressed the trigger issue. And it was a lot cheaper for Uncle Sam. I’ve only shot the P320 not its enlisted brother. I can say with confidence it’s an upgrade from the beretta. I own several Sigs but none of which are poly framed. Because of this I don’t see myself owning a p320 or M17 anytime soon. My 226,229, & 938 are perfectly accurate and reliable. I was going to buy the P365 but not after watching several videos and reading the forums. I’ll wait until Sig irons out the wrinkles. For those of you who prefer a hammer on your poly guns the SP2022 is a really great gun that too often goes unappreciated. It too has seen military service. The only poly Sigs I’ll even consider are the 320/M17 and the 2022. Steer clear of the rest. Thanks for bringing up the Sig 2022. You are correct about this pistol. Not only is it hammer fired, it was Sig’s first polymer pistol back in 1998. It was based on the Sig 220 design of 1975. It is also used quite a lot in law enforcement. I bought mine after it became the SP 2022 post 2009. Totally reliable and way more accurate than my ability. I don’t care if they call it the “poor man’s 226”. The 320/M17 would be a nice “like to have” but the SP2022 is a much more sensible carry pistol. The modularity is nice but you can almost buy another pistol for the price of an upper receiver/caliber change. Wouldn’t touch a 365 with a ten ft. pole for quite a while yet. I really want one when the coast is clear. Does the M-17 or P320 come in 40 cal? I know the 320 is offered in .40 and Sig brought a .40 M17 to the test but the military was only interested in NATO cartridges. But LE and private security may look at it with interest. I’m a big fan of .40 s&w. For those of us who handload we know how de-tuned the over the counter ammo is. The 40 outperforms both 9 and 45 by a good margin even in their +P+ forms. You just have to roll your own. Using published load data from Hodgdon I can get my USP and 226 to push a 135 gr HP to 1475 fps and not even be at max pressure. That’s running even with most 10mm loads of the same weight. That’s over 650 fpe!! Even out of my little PPS it’s going 1420ish. 9 and 45 can’t do that, I’ve tried. As long as you can handle a little more snap, it’s the way to go. The P320 is offered in 9mm, 40S&W, 357 Sig, and 45 ACP. Me too. I like the fact Wilson Combat and Langdon Tactical are breathing new life into the 92 platform.